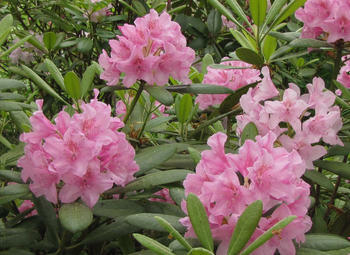 'Helsinki University' is an extremely hardy mid-sized rhododendron hybrid. It was the first of the Finnish hybrids, introduced in 1990, the University’s 350th anniversary. The female parent was the Mustila Rhododendron (R. brachycarpum var. tigerstedtii), but the pollinator is not known. Beautiful flowers cover the shrub about the middle of June. They are pink with a dark spotted pattern, the whole plant being similar to the ‘Haaga’ hybrid. The easiest distinguishing feature is the colour of the buds, with those on ‘Haaga’ being redder. Also the stamen filaments in the ‘Haaga’ flowers are deeper pink than those of ‘Helsinki University’. 'Helsinki University' has a regular round habit, growing to 1.5m in 10 years. At Mustila it has grown to man size since planting early this century.